"In this lucid, erudite, penetrating book, David Sylvan and Stephen Majeski turn standard analyses of U.S. foreign policy upside down. The tale they tell is one of means shaping ends, of instruments driving policies, of bureaucracies creating rather than serving national interests.Sylvan and Majeskis cybernetic account of U.S. foreign policy is shockingly compelling - conceptually sound and empirically rich. 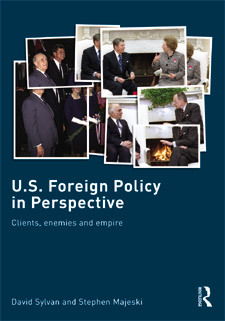 This book is a must-read for any serious student of U.S. foreign policy." "Sylvan and Majeski flip a Gestalt switch to illuminate the continuity of US foreign policy. They consider it the product not of some conjectured grand strategy, but of the policy instruments available to policymakers. By examining US foreign policy from its actual means, not its putative ends, Sylvan and Majeski produce a fresh and compelling account that amounts to a more nuanced understanding of the inner workings of imperial politics after colonialism."